John Mitton,aka. “Grover John”., 5th child of Edmund (a weaver in Horton) was born June 24, 1818 Horton-in-Ribblesdale d. Jan. 28, 1885, Ridgetown, Canada. m. Jane Spence born. 1824. Johns and Jane Spence`s children are Mary Ann born 1845, Edmund D. born.1847, Icedoor born. 1849, Wm. Welbury born 1851, Pamila born 1853, Elizabeth Alice born 1858, Sarah born 1858, Hannah born 1859. The family of Edmund Mitton of Yorkshire, England near Horton in Ribblesdale immigrated to Ontario in 1818 after the baptism of son John on Aug. 9th. 1818 at St. Oswald’s, Horton in Ribblesdale, Yorkshire. Marriage license of Edmund and Mary Stott 1809 who immigrated to Kent County, Canada in 1818. Location appears to be Hubberholme, Yorkshire where his father Robert was born Nov. 4th. 1759. Robert was one of Joseph “Squire” Mittons 5 children. He is identified here as a farmer. Later it was said that he was a weaver. Between the end of the Napoleonic wars and the Corn laws many people changed how they made a living. And many migrated. Another factor may have been the “Corn Laws” between 1815-46 that favored the landed gentry. This caused agriculture prices to rise due to restrictive import tariffs that benefited the domestic owners of land that produced agricultural products but not the consumers. It even resulted in a violent protest in Manchester resulting in British troops killing a number of protestors. How much all this motivated the Mittons to leave for Canada in 1818 I can not say. But the timing is such they may have decided that Canada would provide a better living rather than where they had been for centuries. And it did. Edmund’s brothers followed over the next decade or so to join him in Kent county, Ontario. Were Corn Laws a factor for immigration? “All though England regulated prices of corn since the seventeenth century, the Corn Laws to which people in the nineteenth century refer originated in 1815. At the end of the French Wars that year Parliament passed legislation that stated that no foreign corn could be imported into Britain until domestic corn cost 80/- per quarter. The high price caused the cost of food to increase and consequently depressed the domestic market for manufactured goods because people spent the bulk of their earnings on food rather than commodities. The Corn Laws also caused great distress among the working classes in the towns. These people were unable to grow their own food and had to pay the high prices in order to stay alive. Since the vast majority of voters and Members of Parliament were landowners, the government was unwilling to reconsider the new legislation in order to help the economy, the poor or the manufacturers who laid off workers in times of restricted trade”. “The feeling between the Americans and the British, which was never friendly after the War of the Revolution, was given a further impetus by the War of 1812 so that the United States was not an inviting field for a Britishers to settle in. For instance………, in passing through on their way to Canada some were taunted and insulted by reason of their nationality, which was no doubt apparent by their accents”- Memories of Ridgetown. “This Kent County Ontario line of the Mitton family were one of the first settlers in Howard Township. They came in a group of four other families from England. The Mitton`s in this district immigrated from Horton in England, landing in New York, thence north and west along the line of travel to Buffalo, then by boat or with wagons and oxen to Colonel Talbot`s place on Lake Erie; the Colonel being the land agent”- Memories of Ridgetown. Manley Hillard Mitton born. Aug. 11, 1908 – died June 30, 2005 at the tombstone of the original Ridgetown settlers, his great, great Grandparents, Edumud and Mary Stott. Edmund Mitton was a weaver in the old country “according to “Memories of Ridgetown” (his hand written 1809 marriage license identifies him as a farmer?). Later his is identified as a laborer at the time of his son John baptism in Aug. 1818. This could have meant a weaver? He and his wife must have been a sturdy pair because after they, with their children had landed in New York, they walked all the way to Colonel Talbot`s place on Lake Erie, a distance of over five Hundred miles. Mrs. Mitton carried the baby (John aka. Grover John) in her arms; the baby being the late John Mitton, father of E.D. Mitton and 2nd. great Grandfather of the author. There were eight children of Edmund Mitton altogether. 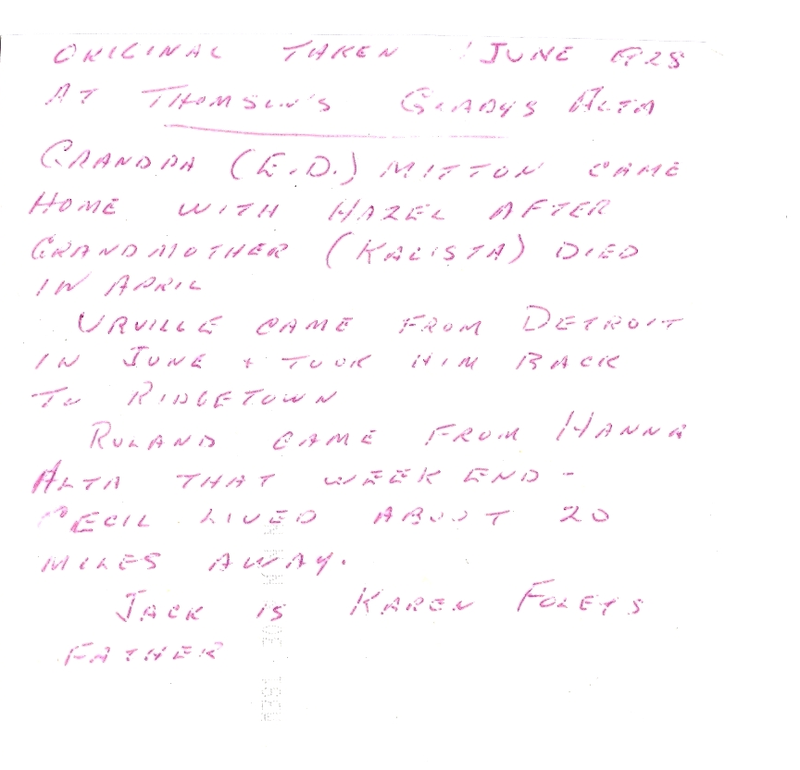 Besides John Mitton, both James S. Mitton and William Mitton spent their entire lives in Ridgetown. The Mitton farm adjoined that of the Watson`s farm on the east. Edmund Mitton located his family on lot ten in the ninth concession, Howard, and on his farm is that portion of the town known as Ward Four. His settler’s cabin was located on the rise of ground back of Roszell & Graves’. Certified baptism doc from March 7, 1980 of John Mitton baptism August 9, 1818 from county records of the parish church of Horton in Ribblesdale. Grover John Mitton. He was the 5th and youngest son of Edmund born June 24, 1818 not the eldest one as above. He was baptized on Aug. 9, 1818 at St. Oswald’s in Horton. John Mitton was born in England and baptized at St. Oswald Horton in Ribblesdale, August 1818. He immigrated with his parents the same year to Canada. He was a good farmer (this part of Ontario had very rich farmland), successful hunter of game and fur bearing animals. His exceptionally fine rifle with powder horn and bullet pouch is still with the Ontario family Mitton`s. It is of exceptional workmanship and silver inlays. His house was considered one of the first brick ones in the area and an example of his success as a farmer for he and his family. Unlike his parents in England John had become part of the successful landed gentry of Ontario and was able to educate his son Edmund who became a company officer as a Treasurer. The early history of Ridgetown from which so many Ontario Mitton`s lived is bound up with the history of the Township of Howard until it became incorporated as a village. Up to that time its affairs were administered by the township council.Ridgetown until January 1850 was designated as “Mitton`s Schoolhouse”. The town meetings were held there beginning 1843 thru1850 when the the first township council for Howard was elected in January 1850, It held its first meeting at “Mitton`s” schoolhouse on January 21st. 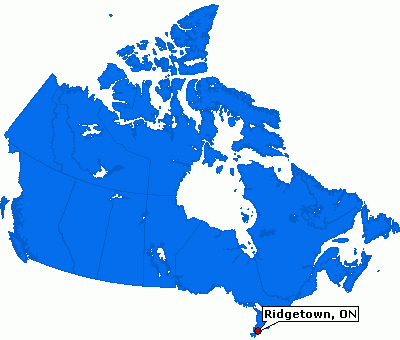 The first record of Ridgetown was for a place of business was in the minutes for the township council of December 16th. 1851. The Mitton`s Schoolhouse was used as a schoolhouse and meeting place as late as 1854. It was later used as butchers hop by “Blacksmith Mitton. Authors note; there were so many Mitton`s in this area that locals gave them nicknames to distinguish which Mitton you were referring too. The “Ridge” that the above trapper Shippey led the Mitton`s and others too in 1824 was of course later adapted as the name of the town; Ridgetown. The brother of Edmund, James after his first wife died in 1839 remarried Alice Armstrong. 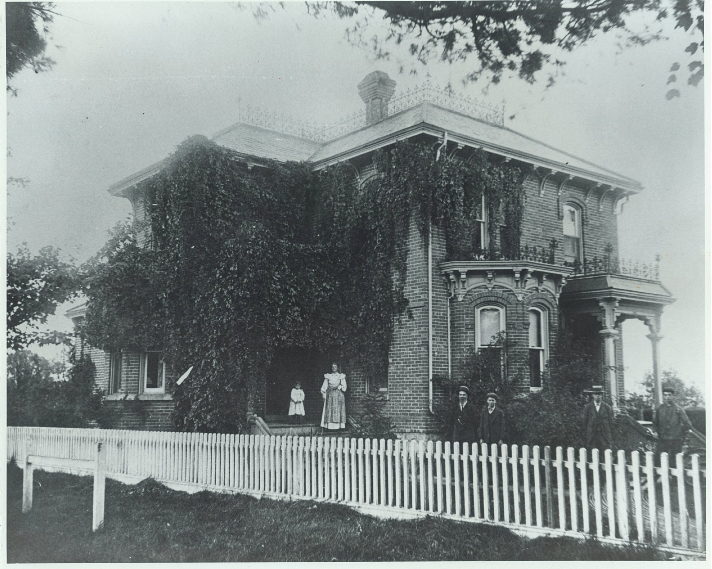 Following the birth of their daughter Mary Ann in late 1840, James and his family emigrated to Kent county, Ontario as his brother had before. James family included his children, Jane, John Whaley, Robert and Henry. Robert was 8 years old. A total of four siblings eventually immigrated to Kent County from the Craven area. These early sibling families of Mittons from the Craven area explains why their were so many Mitton in this area by the end of the century. Nicknames became the main way to identify which Mitton you were referring too. James moniker was Blacksmith Jim to distinguish him from the other Mittons in the county. 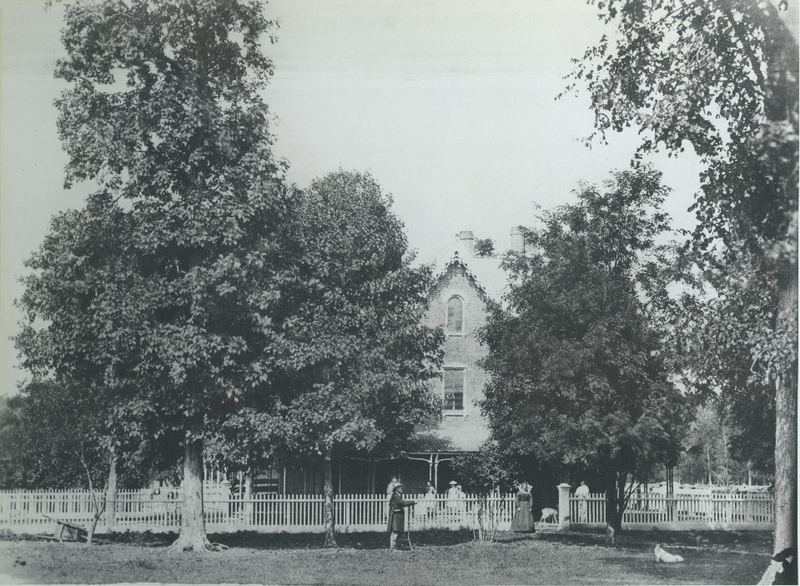 This house was that of “Grover John”, son of Edmund pictured above with wife and family. The house was made of brick which was unusual if not expensive for the times. However, it did burned down around 1912. Manley Hillard Mitton a great, grandson of “Grover John” was taken on a buckboard from Ridgetown as a small boy out to this location to observe the fire that destroyed the old house of “Grover John”. Urville Mitton (the authors grandfather) was Edmund of Ribblesdale great grandson. He became a US citizen and eventually settled a hundred years later after his great grandfather “Grover John” 60 miles west of Kent County Ontario in Detroit, Michigan. He was a pharmacist and optometrist and had attended the University of Toronto around the turn of the 20th century. He passed away in 1954 and is buried in Grand lawn cemetery, Detroit Michigan with his wife Margarete Milligan also born in Ontario, Canada. Edmund D. Mitton son of “Grover John” , Kent County, Ontario br. April 8, 1847 died 1930, Ridgetown Ontario. aka: “Eddie the clerk”. m. Kalista Kitchen. 4 children; Milo Roland br. ? Urville br. 1880, Cecil Norman br. 1881, Hazel, m. Kalista br. 1894.
sons: Cecil, Urville & Roland. 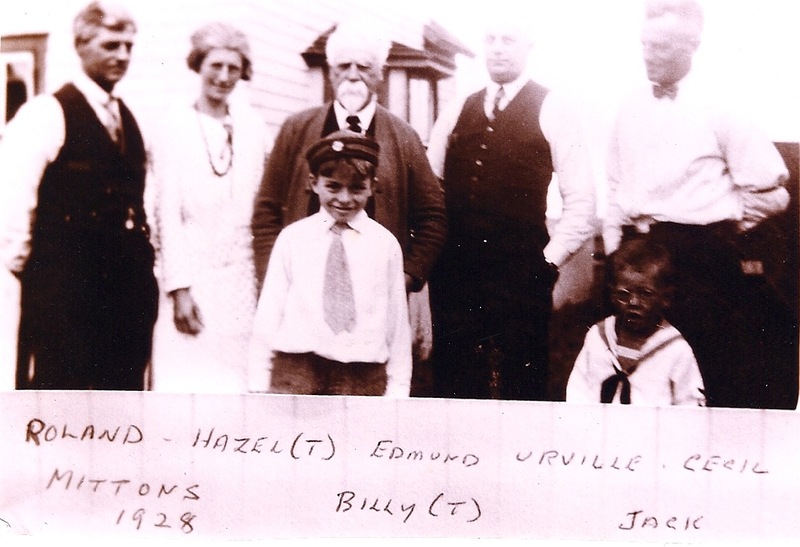 Authors note: Hazel (above photo in doorway next to her mother), the daughter of Edmund (referenced above) and sister of Urville and great Aunt of the author noted that she was raised on stories about subsequent Mittons that immigrated to Utah where they became Mormons. These may have been the descendent’s of William and his wife Ann Plastard who would have been her Uncle and Aunt as well as to my grandfather Urville. This has not been substantiated except their are Mitton family members today living in Utah that are of the same descendant’s bloodlines of the Mittons of Craven in Lancashire. The Mitton family in 1928 including my grandfather Urville, standing to right next to his father Edmund. Hazel daughter to the left of her father. Manley H. Mittons genealogy tree of the Canadian Mittons descendants of Joesph “Squire” Mitton of Horton in Ribblesdale 1723-92 buried at St. Oswald’s, Horton-in-Ribblesdale, Yorkshire England.